​They also considered 14 unfavourable effects: six adverse events and eight serious adverse events (listed in the table at the bottom of this page). Here is the overall result. Green figures indicate the best benefit-safety balance; Red the worst. The numbers are scores out of 100, which represent the overall added clinical value of each analgesic. They take into account available data for the effects and judgements by the experts about the clinical relevance of the effects. After the favourable effects have been weighted for their added clinical value, they are described as benefits. For the unfavourable effects, the inverse of their weighted loss-of-value is referred to as safety. The resulting benefit-safety balance does not consider contra-indications, interactions with any drugs, or any precautions. 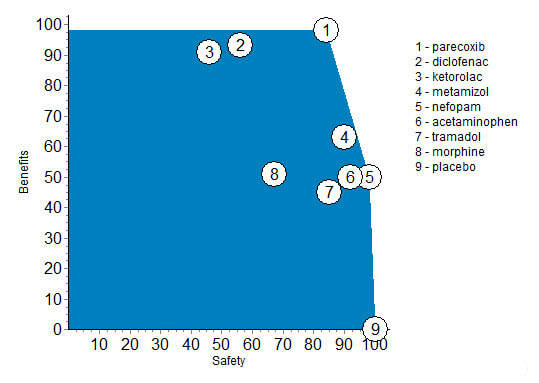 The following table shows the scores separately for the benefits and safety effects, and their weighted average, which is the benefit-safety balance. Bar graphs after the 64-36 weight is applied show the separate contribution of benefits and safety to the total. A scatter plot of effects before weighting between benefits and safety shows parecoxib is best for benefits while nefopam is safest. Note that while diclofenac and ketorolac are nearly as beneficial as parecoxib, the latter is much safer. Parecoxib is also better than morphine in both benefits and safety. Tramadol is about as safe as parecocib, but the latter is more beneficial. Finally, nefopam is better in both benefits and safety than tramadol, and is about the same in benefits as acetaminophen, but is safer. These dominance relationships suggest that overall, parecoxib or nefopam are better than any of the other analgesics in benefits, or in safety, or both benefits and safety. 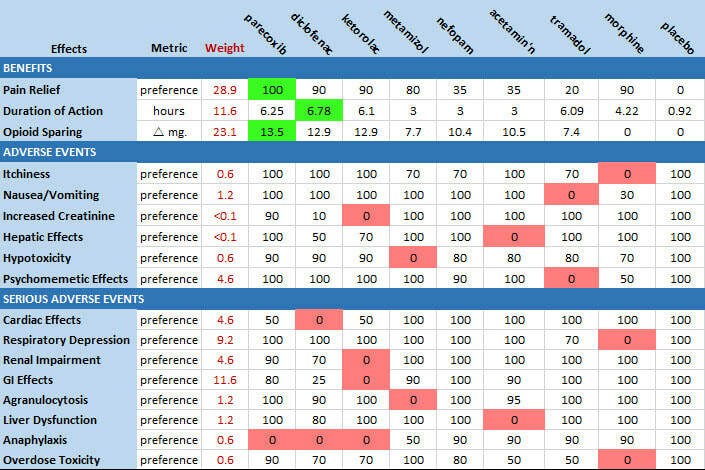 All these results are based on the Effects Table below. For the Duration of Action and Opioid Sparing, the figures are medians of data gleaned from published data. For the remaining unfavourable effects, data were limited or not available, so the experts discussed available published research and shared their experience and knowledge in assessing direct preference values ranging from zero to 100. For Pain Relief and all the unfavourable effects, each row defines a scale with 100 representing the most preferred analgesic for that effect, and zero the least preferred analgesic (sometimes with ties). Numbers between 0 and 100 represent experts' judgements about the magnitude of clinical value for the associated analgesic compared to the best and worst analgesics. Note that these numbers are relative, so zero does not mean no value, it represents the analgesic with least clinical value for that effect. ​To support patient-oriented prescribing based on the evidence, green shading identifies the best drug for each favourable effect with red the worst drug for each unfavourable effect. Pain relief: Proportion of patients reporting at least 50% pain relief within 4 hours. Duration of action: Median time to rescue medication. The MCDA model was created over five workshops with Pfizer specialists who agreed the analgesics to be compared and the favourable and unfavourable effects, followed by a decision conference in which the two clinicians/experts validated the model and applied their clinical judgement. The main limitation of this analysis is that the preference values and weights are based mainly on the judgements of only two independent experts/clinicians.